In the First Era, following the discovery of the Heart of Lorkhan by the Dwemer, Lord Kagrenac and his tonal architects created Kagrenac's Tools to manipulate the Heart via tonal architecture and use it to create their own god, the Numidium. 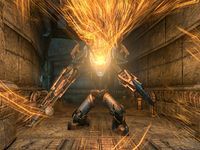 Instead, this act ultimately led to the disappearance of the Dwemer in 1E 700, and the tools were subsequently used by the Tribunal and Dagoth Ur to achieve divinity. Sotha Sil drew inspiration from the Dwemer for his creations, and their influence in his work is rumored to be traceable as far back as before their disappearance. Among these influences was his research on Dwemer tonal architecture, which he uses to perform his divine workings. He refined it further and created items based on their research, such as improving Dwemer tonal forks that could function as a divining rod, and the Resonant Sphere, one of Sotha Sil's minor marvels. The sphere produces an aural response upon applying magic to it, and chimes with a sound similar to the ones that ring in the Brass Fortress.